Tools for training, selecting, and evaluating maximum entropy (and standard logistic regression) distribution models. 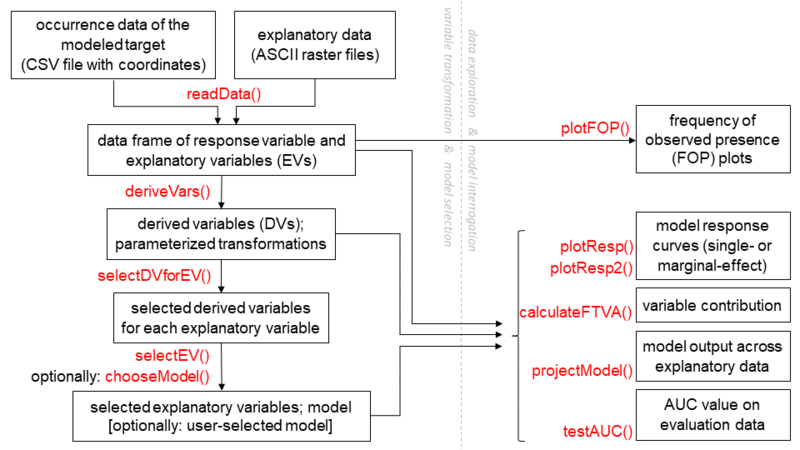 This package provides tools for user-controlled transformation of explanatory variables, selection of variables by nested model comparison, and flexible model evaluation and projection. It follows principles based on the maximum-likelihood interpretation of maximum entropy modeling (Halvorsen et al., 2015), and uses infinitely-weighted logistic regression for model fitting. (Fithian & Hastie, 2013). MIAmaxent is intended primarily for maximum entropy distribution modeling (Phillips et al., 2006; Phillips et al., 2017), but provides an alternative to the standard methodology for training, selecting, and using models. The major advantage in this alternative methodology is greater user control – in variable transformations, in variable selection, and in model output. Comparisons also suggest that this methodology results in simpler models with equally good predictive ability, and reduces the risk of overfitting (Halvorsen et al., 2016). The predecessor to this package is the MIA Toolbox, which is described in detail in Mazzoni et al. (2015). This diagram outlines a common workflow for users of this package. Functions are shown in red. Fithian, W., & Hastie, T. (2013). Finite-sample equivalence in statistical models for presence-only data. The annals of applied statistics, 7(4), 1917. Halvorsen, R., Mazzoni, S., Bryn, A. & Bakkestuen, V. (2015) Opportunities for improved distribution modelling practice via a strict maximum likelihood interpretation of MaxEnt. Ecography, 38, 172-183. Halvorsen, R., Mazzoni, S., Dirksen, J.W., Næsset, E., Gobakken, T. & Ohlson, M. (2016) How important are choice of model selection method and spatial autocorrelation of presence data for distribution modelling by MaxEnt? Ecological Modelling, 328, 108-118. Mazzoni, S., Halvorsen, R. & Bakkestuen, V. (2015) MIAT: Modular R-wrappers for flexible implementation of MaxEnt distribution modelling. Ecological Informatics, 30, 215-221. Phillips, S.J., Anderson, R.P., Dudík, M., Schapire, R.E., & Blair, M.E. (2017). Opening the black box: an open‐source release of Maxent. Ecography, 40(7), 887-893. Phillips, S.J., Anderson, R.P. & Schapire, R.E. (2006) Maximum entropy modeling of species geographic distributions. Ecological Modelling, 190, 231-259. Model fitting implemented as infinitely-weighted logistic regression, so that all computation can be done natively in R (maxent.jar no longer required). Implements choice of algorithm: "maxent" for maximum entropy or "LR" for standard logistic regression (binomial GLM). Directories specified by 'dir' argument are created if they do not already exist. Existing results in directories specified by 'dir' argument are overwritten, if desired. Fixed bug in selectEV that occurred when the last round of model selection before interaction terms did not result in a significant variable. Unnecessary dependency on Hmisc removed. Removed version minimums for dependencies which are default packages, to allow r-oldrel binary. Changed names of toy data used in examples for better organization.